Many guitar players, famous and not so famous began playing on Japanese electric guitars, yet the history of the people and factories that produced these instruments has remained largely ignored. 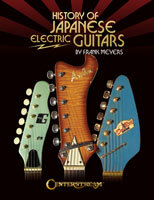 For the first time in this illustrated history, author Frank Meyers will examine the Japanese electric guitars and factories that were active during the 1940s, 1950s, and 1960s, identifying the various people, companies, and guitars that contributed to the huge guitar boom of the 1960s. Includes hundreds of fantastic color photographs, a chapter of 130 pickups, and a chapter on collecting vintage Japanese guitars. A must-have for guitar collectors. This book uses extensive interviews with the Ludwigs and photos from their personal collections to recall the origins, development and tools of crafting drums. You'll also discover why the best drummers use Ludwigs. Over 150 photos and illustrations make this an invaluable reference source for all drummers. �The Complete Hofner Violin Bass Story� has been produced using the Hofner Company archives, and with help from, and a Foreword by, Walter Hofner�s daughter Gerhilde. The book provides the reader with a unique insight into this famous bass guitar, and of the many people who have influenced its path over the last 60 years. Also included: dating a Violin bass, serial numbers, body dates, pickup information and much more. A must have book for all collectors. Tom Harrison's book, How to Become a Film Composer gives up-and-coming composers the inspiration, information and the tools necessary to succeed in today's music for media industry. The book begins with breaking down how to approach music in a dramatic context and how to cultivate your own unique sound. Next, Harrison covers the technical computer skills needed to work in this digital era of music production and finally provides a thorough guide to building a successful career. A fixture on the country scene, Jerry Byrd was a session player in Nashville in the mid-1940s and was influential in the development of the "Nashville Sound." Drawn to the music of Hawaiian steel guitarists, he went on to develop a style and invent tunings that would become synonymous with the instrument. In 1972, Byrd headed for Hawaii, only to discover that the islands had turned their back on the instrument that gave them their signature sound. Thus, Byrd's mission became to reacquaint Hawaii with its own creation. His inspiration not only bridged country and Hawaiian music, but also secured the steel guitar's place in the 21st century.